The H1N1 virus (swine flu) is an infection of the nose, throat, and lungs. It is caused by the H1N1 influenza virus. Which are common ways to catch the flu? The correct answer is B and C. The best lifestyle change you can make to help prevent the flu is to wash your hands often. Which of the following helps protect you from the flu? The correct answer is all of the above. Washing your hands often helps stop the spread of germs. Eating a healthy diet and getting enough sleep help boost your immune system so you’re less likely to get sick. The correct answer is diarrhea. 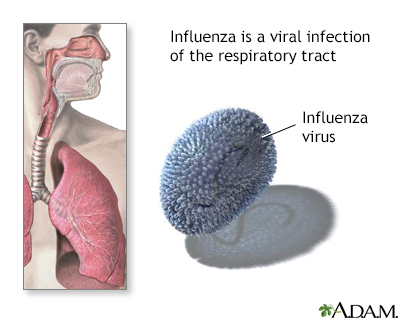 The flu causes symptoms in the nose, throat, and lungs. If you are experiencing flu symptoms, you should avoid contact with other people. How long do flu symptoms last? The correct answer is longer than 1 week. Fever and aches begin to go away between 2 and 4 days after getting the flu. Sneezing, dry cough, runny nose, and sore throat may continue for several days. You may feel tired for weeks. Get plenty of rest and drink a lot of fluids while you’re recovering from the flu. Which of the following is NOT a treatment for the flu? The correct answer is antibiotics. Antibiotics kill bacteria. They do not help fight viruses, and the flu is caused by a virus. Taking antibiotics when they are not needed increases your risk of getting an infection later that can't be treated with antibiotics. Don't ask your doctor for antibiotics when you have the flu. How can you prevent spreading the flu when you’re sick? The correct answer is all of the above. If you get the flu, do all you can to prevent the virus from spreading to friends, loved ones, and strangers. You can get vaccinated for the flu with a nasal spray. The correct answer is true. There are two types of flu vaccines: a flu shot and a nasal spray. The nasal spray is called FluMist. It uses a live, weakened virus instead of a dead one. If you are 2 to 49 years old, and are not pregnant, you may use this vaccine. Talk to your doctor about whether FluMist is right for you. The correct answer is in October. The CDC recommends everyone 6 months and older receive the flu vaccine. You should get the vaccine at the start of flu season (around October in the U.S.). Getting the vaccine as late as March may still help. Which of the following are side effects of the flu vaccine? The correct answer is both A and B. Most people have no side effects from the flu shot. 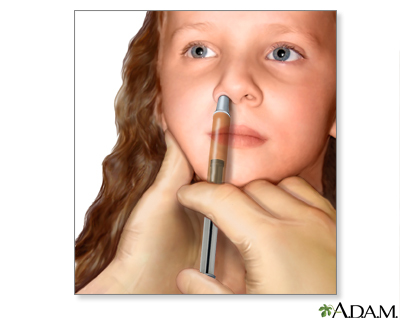 Others may notice soreness at the injection site, minor aches, and low-grade fever for a few days after the shot. Talk to your doctor if you have concerns about getting a flu shot. The correct answer is people who are sick and have a fever. If you have a fever or other illness, you should talk to your doctor before getting vaccinated. The CDC and most doctors recommend waiting until you are healthy to get the vaccine. Washing your hands thoroughly is the best lifestyle change you can make to help prevent the flu. The correct answer is true. Washing your hands often and carefully is the best lifestyle change you can make to help prevent the flu. You should wash your hands with soap and warm water for 15 to 20 seconds, about the time it takes to sing the Happy Birthday song twice. Within the respiratory system, air is first inhaled through the nose or mouth into the pharynx. 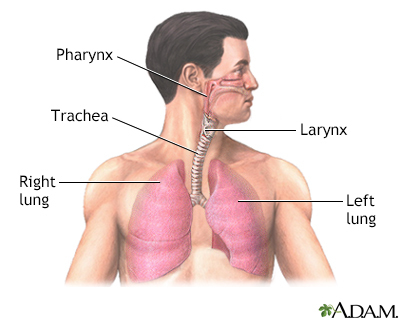 From the pharynx, air is drawn through the larynx and trachea to make its way to the lungs. Reviewed By: Linda J. Vorvick, MD, Clinical Associate Professor, Department of Family Medicine, UW Medicine, School of Medicine, University of Washington, Seattle, WA. Also reviewed by David Zieve, MD, MHA, Medical Director, Brenda Conaway, Editorial Director, and the A.D.A.M. Editorial team. Editorial update 10/08/2018.